Happy Independence Day! While you are reading this, families across the country are celebrating the Fourth with their own family traditions. Some go boating, others go camping, some enjoy a barbecue. As this Communiqué is published, my family is sitting beside a highway in rural Oregon watching a parade of tractors and rodeo queens. Later, we will ride ponies, eat watermelon, drink frozen lemonade and watch a rodeo. That’s our tradition. It’s our way of celebrating the freedom envisioned by our founding fathers and secured by generations of sacrifice. Whatever your tradition for the fourth of July, take time today to remember those who have given so much to ensure a legacy of freedom. On this day, we all have something to celebrate. Whether we are American or not, wealthy or not, healthy or not, we all have been blessed by the hope and freedom symbolized by the Stars and Stripes. 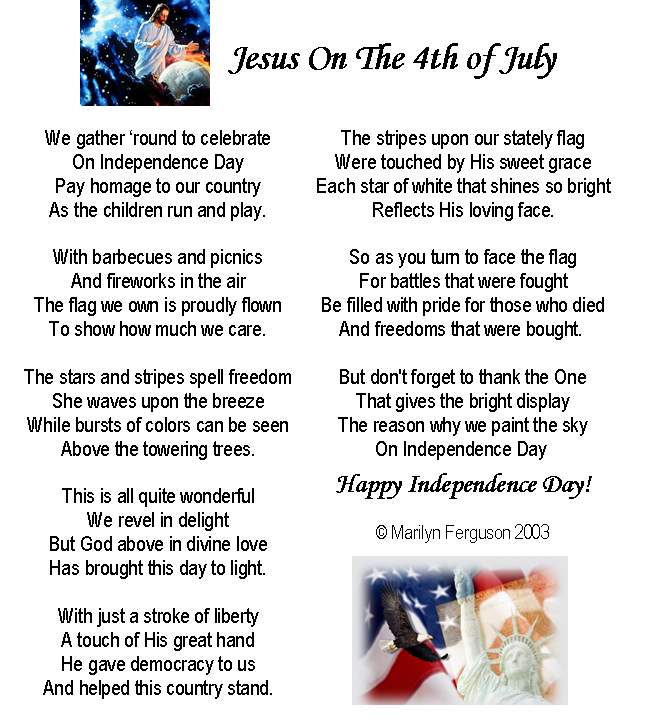 But more importantly, on this Independence, let us give thanks to the Son of God who brought us freedom that can’t be measured in decades or captured in political ideologies. Let us give thanks to the One who gave us freedom from sin and freedom to live as God has called us. Tomorrow in worship, we will be talking much more about freedom. I hope that you’ll be there to participate. Our monthly fellowship potluck is today immediately following the second service. Since it is now summer, we will enjoy picnic foods. The oven will not be available. You are invited to stay, enjoy great food, good friendships, and make new acquaintances. The 85th Gladstone Camp Meeting will be held July 15-19. Speakers this year include, Jo Ann & Richard Davidson, Mike Jones, Chuck Hagele, Gordon Pifher, Marco Quarteroli, Tim Roosenberg, and Mike Tucker. The Plaza Pavilion evening speaker will be David Asscherick. Sunnyside Church will offer two camp-meeting themed services at the church – Sabbath School at 10:00 am, and Worship at 11:00. North American International Student Services (NAISS) is looking for native English-speaking host families. Host families will help Chinese youth overcome Mute English (where people can read and understand English as a second language but cannot speak it well). The program begins in July and runs for approximately 30 days. For more information please visit our website www.naiss-us.com or call 541-228-0667. July 13, 11 am to 3 pm: Purple Crying Education – be a light! Call all members to be PURPLE Crying educational lights in their communities. A special open house: Knit-in & Work Party, to help prevent Shaken Baby Syndrome as part of the “Click For Babies” project. Learn more here: http://goo.gl/pmYU3D / http://goo.gl/l8VRSJ or http://goo.gl/l8VRSJ. July 15-27, 2014: Adventist Book Center’s Camp Meeting Sale. Save $12.00-$25.00 off the case price on our food super specials. Many Bibles, books, cook books, and music are also on sale. Download the sale flyer at abcflyer.com.